The court is based at the John Joseph Moakley Federal Courthouse in Boston, Massachusetts. Most sittings are held in Boston, where the court usually sits for one week most months of the year; in one of July or August, it takes a summer break and does not sit. The First Circuit also sits for one week each March and November at the Jose V. Toledo Federal Building and United States Courthouse in Old San Juan, Puerto Rico, and occasionally sits at other locations within the circuit. With six active judges and four active senior judges, the First Circuit is the smallest of the thirteen United States courts of appeals. Since retiring from the United States Supreme Court, Associate Justice David Souter regularly sits on the First Circuit by designation. ^ Colt was appointed as a circuit judge for the First Circuit in 1884 by Chester A. Arthur. The Judiciary Act of 1891 reassigned his seat to what is now the U.S. Court of Appeals for the First Circuit. The court has six seats for active judges, numbered in the order in which they were filled. Judges who retire into senior status remain on the bench but leave their seat vacant. That seat is filled by the next circuit judge appointed by the president. ^ "Court Calendar". United States Court of Appeals for the First Circuit. Retrieved October 26, 2012. In January through June, and October through December, the Court usually sits for one week starting on the first Monday of the month. In either July or August, the court sits for one week. In September, the Court starts on the Wednesday after Labor Day and sits for the 3 days in that week and the 5 days in the following week. In November and March the court sits two weeks, with one week in Boston and one week in Puerto Rico. Court sittings are held in the morning, typically between 9:30 a.m. and 1:00 p.m.
^ "U. S. Court of Appeals for the First Circuit". Official website of the Federal Judicial Center. Archived from the original on December 31, 2004. Retrieved May 29, 2005. Dargo, George (1993). A History of the United States Court of Appeals for the First Circuit: Volume I, 1891–1960. 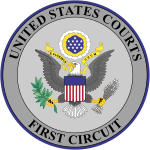 United States Courts for the First Circuit. "2002 Annual Report" (PDF). Archived from the original (PDF) on October 15, 2004.